How did we get from plans to take down a statue of Robert E. Lee in Virginia to a proposal to remove the Christopher Columbus monument in New York? If you are a liberal activist, the issues are one in the same. However, opinion polls showed most Americans supported President Trump’s view. A PBS poll showed that significant majorities opposed right-wing extremist rhetoric yet also believed that the statues should remain. A Valient Market Research poll showed only 33% favored taking down the Confederate statues. History was more important than political correctness. But while removing the monuments is an unpopular idea nationally, it is a winner in urban Democratic power centers, so across the country the rebels are being defeated once again. It is not just the Confederates who are being tumbled from their pedestals. President Trump wondered aloud about the potential for escalation, asking “is it George Washington next week, and is it Thomas Jefferson the week after?” Indeed yes; Bishop James E. Dukes of Chicago’s Liberation Christian Center petitioned for a George Washington statue to be removed from his city, and a statue of Thomas Jefferson at the University of Virginia, which he founded, was vandalized. And it doesn’t stop there. Across the country liberals have been triggered to act against monuments of all kinds. The Lincoln Memorial, erected to a man who opposed and destroyed the Confederacy, was spray-painted and a bust of him was burned in Chicago. Activists proposed that Mt. Rushmore be destroyed. An Ohio Revolutionary War statue was decapitated. The Iwo Jima memorial outside Marine Corps Base Quantico was vandalized. Someone in New Orleans even spray painted “Take it down!” on a statue of 15th Century French national hero Saint Joan of Arc. Apparently they want to refight the Hundred Years War. Meanwhile in New York City, Mayor DeBlasio is undertaking a secret review of “hate symbols” in the city, that some say may even include the burial site of Union (i.e., not Confederate) General and President Ulysses S. Grant. But the most prominent potential victim of this revisionist effort is Christopher Columbus. The Columbus Circle monument was a gift from Italy to commemorate the 400th anniversary of the Genoan mariner’s voyage. There was a five-day celebration when it was unveiled in 1892. Now it may be hauled off to a landfill in the dead of night. Columbus has long been on the left-wing hit list, since they blame his 1492 voyage to the New World for everything bad that followed. Columbus represents the original sin that led to the destruction of the native peoples in the western hemisphere, the erection of the global slave trade, imperialism, capitalism, and the western “system of oppression” in general. For those under the sway of identity politics, intersectionality and hostility to western civilization, he is public enemy number one. 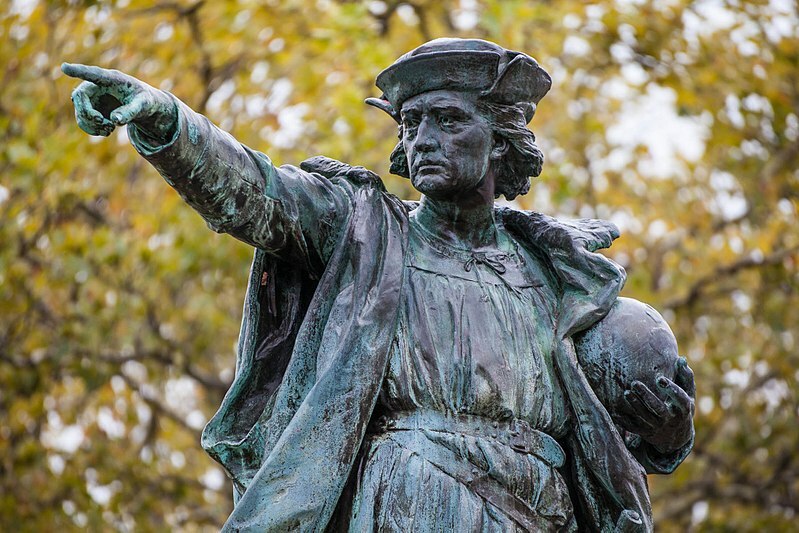 So in Yonkers a Columbus bust was knocked from its pedestal and broken in pieces, and on Wednesday the Los Angeles City Council voted to replace the Columbus Day holiday with Indigenous Peoples Day. These are not new issues. The academic and radical left has long had contempt for the Founding Fathers, Columbus, and other “dead white males.” But never have mainstream politicians and commentators been so in thrall of these radical notions. What was once the province of anti-American fringe elements has become accepted, if not mandatory, in liberal circles. It underscores the critical divide in American public life between those view imperfect America with all its flaws as representing history’s greatest experiment in freedom, and those who view the entire enterprise with contempt.